A TAMILIAN TO JOIN THE LIST WITH STEVEN SPEILBERG! REMI Awards is one of the coveted awards that acknowledge talents from all over the globe in the field of filmmaking. Debutant director, Arun Chidambaram’s Kanavu Variyam, is a film based on power outage in Tamil Nadu which has a science film’s edge to it. This film has won the REMI award at the 49th WorldFest Houston International. The award function will be held on April 17th 2016. It should be noted that Arun is the first Tamil director who will receive this honor. When Behindwoods spoke to Arun Chidambaram to congratulate him on this feat, he had few nice things to share. “REMI was the first award that filmmaker like Steven Spielberg received. The list of other recipients includes George Lucas, Cohen Brothers and Ang Lee. REMI has made sure to spot upcoming talents and I am very happy that they did the same with Kanavu Variyam. We are planning the theatrical release in Tamil Nadu after the world premiere of the film that will be at WorldFest-Houston on April 9th, 2016 at 7 PM at AMC Studio 30, 2949 Dunvale Road, Houston”. The filmmaker is also confident that the audience will walk out of the hall with lots of inspiration. “I am one among the audience, so the film is sure to be entertaining and engaging. 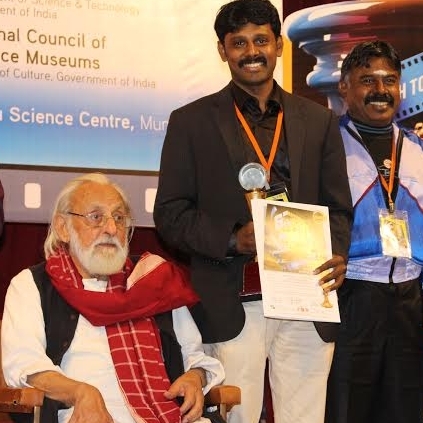 A Science film tends to obtain a dry documentary feel, but Kanavu Variyam is an exception definitely and Dadasaheb Phalke Award winning filmmaker Shyam Benegal also said the same thing. He is the only Indian filmmaker to have watched my film”. This film is definitely going to make some noise close to its theatrical release and we wish this young team all success! People looking for online information on Arun Chidambaram, Kanavu Variyam, REMI Award will find this news story useful.